Lancaster is a small city in Lancashire with a population of around 46,000. Preston is the administrative centre of the county but Lancaster is its county town or ‘capital’. The wider local authority district encompasses surrounding towns such as Morecambe, Carnforth and Heysham. It boasts a population of approximately 140,000. 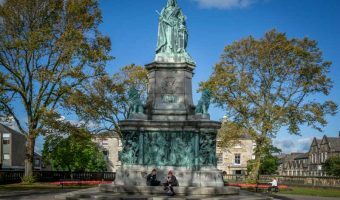 The historic city has strong connections with the British monarchy. The Duchy of Lancaster, one of only two duchies in England, provides income for the Queen in her role as the Duke of Lancaster. In 1937 Lancaster’s royal ties were formally recognised when King George VI granted it city status. Lancaster University was founded in 1964. It now provides top class education to around 13,000 undergraduate and postgraduate students. The impressive Lancaster Castle was founded in the eleventh century. Over the years has played an important role in the city’s history. In 1612 the famous trials of the Pendle Witches were held here. In 1975 it was the location for the trial of the Birmingham Six. Until the beginning of 2011 the castle was still a functioning prison. Lancaster Priory is next to the castle. 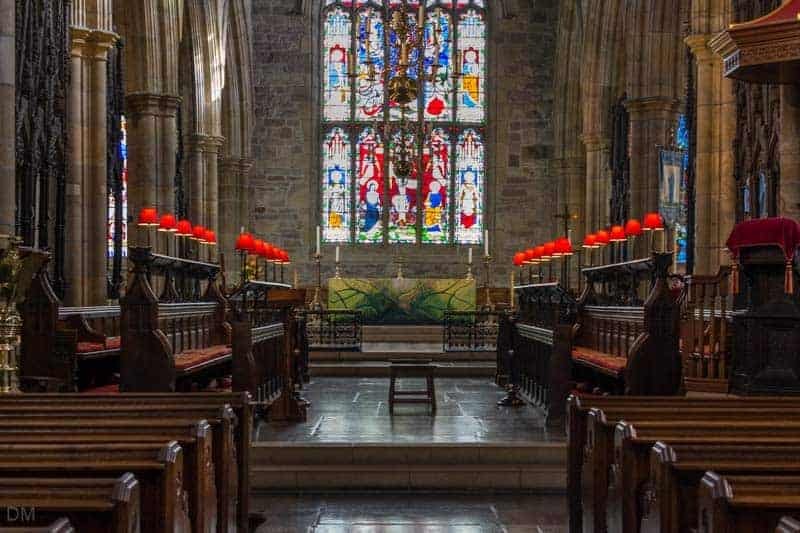 It contains a number of interesting features including fourteenth century oak choir stalls and the regimental chapel of the King’s Own Royal Regiment (Lancaster). It is open to the public and admission is free. Just down the road from the castle and priory is the Judges Lodgings’ museum. 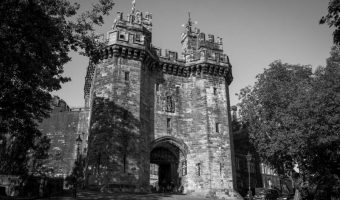 This seventeenth century Grade I listed building was once the home of Thomas Covell, Keeper of Lancaster Castle and the man responsible for the imprisonment and interrogation of the Pendle Witches. The upper floor of the building now houses a collection of Gillow furniture while the lower features a gallery devoted to antique toys and dolls. The Covell Cross, outside the museum, was designed by famous Lancaster architects Austin and Paley. The Cottage Museum, built in 1739, offers an insight into ordinary Victorian life. It opens in the afternoons from Easter to September. Lancaster City Museum is housed within the Old Town Hall on Market Square and traces the history of Lancaster from the Roman era to the present day. It boasts great collections of Roman artefacts, fine and decorative art, and is also home to the museum of the King’s Own Royal Regiment (Lancaster). During the eighteenth century Lancaster was one of the busiest ports in the country. In 1985 the old Custom House at St George’s Quay, designed by Richard Gillow of the city’s famous furniture manufacturers, opened as the Lancaster Maritime Museum. Displays here explore topics such as Morecambe Bay, the fishing industry, and the city’s role in the slave trade. Further information about Lancaster Maritime Museum, the Judges’ Lodgings, and the Cottage Museum can be found on the Lancashire Museums website. Despite its small size, Lancaster has a thriving arts scene. There are two theatres in the city centre; The Dukes and the Grand Theatre. The Dukes also functions as a cinema, showing mainly arthouse films and documentaries. Mainstream movies can be seen at the six-screen Vue Cinema on Church Street. The Ashton Memorial is the most prominent landmark in the city. 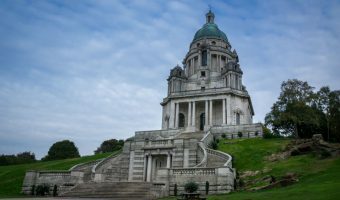 It is one of many attractions at the beautiful Williamson Park, built by local millionaire James Williamson at the turn of the century. In the summer the park hosts the UK’s largest outdoor walkabout theatre season. The Lune Valley is one of the most beautiful and unspoilt rural areas in North West England. One of the best ways to see it is to complete the Lune Valley Ramble. 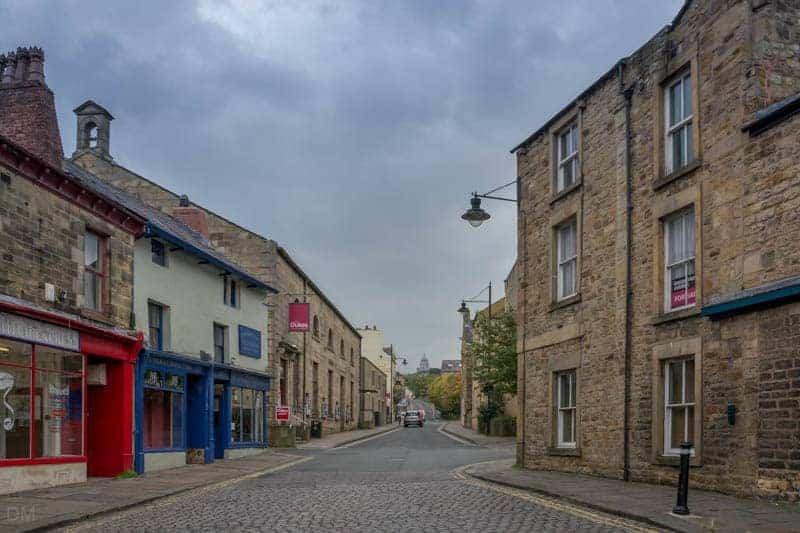 The 17-mile route begins in Lancaster and ends in the market town of Kirkby Lonsdale in Cumbria. It follows the course of the River Lune. Sights and villages on the route include the Lune Aqueduct and Lancaster Canal, Halton, the Crook o’ Lune, Caton, Aughton, Gressingham, Hornby and Hornby Castle, Loyn Bridge, Castle Stede, Arkholme, and the Devil’s Bridge. Carnforth is a small town five miles north of Lancaster. Carnforth Train Station was the setting for scenes from David Lean’s film Brief Encounter. Places to visit nearby include historic Leighton Hall and the Leighton Moss RSPB nature reserve. More information about all these attractions can be found at the Lancaster Visitor Information Centre. Morecambe is just a couple of miles from Lancaster. The main attractions in the seaside town are Happy Mount Park, The Platform, Morecambe Superbowl, and the Reel Cinema. Despite its small size, Lancaster offers a good choice of accommodation options. Lancaster city centre is compact and mainly pedestrianised. It offers good mix of independent stores and high street names. There are two shopping centres; Market Gate Shopping and the St Nicholas Arcades. The city gained its market charter in 1193 and today boasts two permanent markets. The Charter Market is a traditional outdoor market held every Wednesday and Saturday around Market Square and Market Street. Stalls sell a good range of products including fresh fruit and vegetables, books, clothes, jewellery, and freshly cooked food. The Assembly Rooms Emporium is housed in an eighteenth century building on King Street. It offers a mix of stalls selling vintage clothing, collectibles, books, and antiques. The main retail parks in Lancaster are the Kingsway Retail Park (PC World and Laura Ashley), the Lancaster Retail Park (Dunelm, Harveys, Pets at Home, Matalan etc.) and Parliament Street Retail Park (Currys and Halfords). The M6 motorway lies just east of the Lancaster city centre. It offers quick and easy access to and from Manchester, Liverpool, Preston, Kendal, Penrith, and Carlisle. Junction 34 offers the quickest access to the centre while Junction 33 is suitable for visitors going to Lancaster University. Lancaster Services are close to Junction 33. The A6 runs parallel to the motorway and connects Manchester to Carlisle. It passes through Preston, Lancaster, Carnforth, Kendal, and Penrith. Lancaster city centre offers a good choice of car parks. Most are operated by Lancaster City Council. 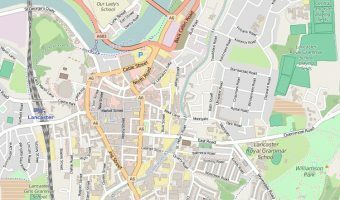 They include the Edward Street Car Park (near The Dukes theatre, postcode LA1 1QE) and the Auction Mart Car Park (opposite Kwik-Fit on Thurnham Street, postcode LA1 1XU). There are privately operated car parks at Lancaster Train Station and Market Gate Shopping. Lancaster Bus Station offers local, regional and national services. Lancaster Train Station is situated in the city centre and lies on the West Coast Mainline. There are direct trains from stations such as Glasgow Central, Carlisle, Penrith, Oxenholme Lake District, Preston, Wigan North Western, Warrington Bank Quay, and London Euston. Northern Rail offers a local service between Lancaster and Morecambe, calling at Bare Lane. 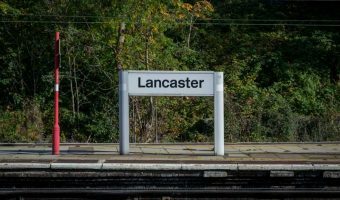 The train journey from Lancaster to Morecambe takes just 10 minutes. 5-day weather forecast for Lancaster. View temperature, wind speed and chance of rain.